About 10 years ago, in my pre-Master Gardener days, I decided to add a mini-orchard to my gardening endeavors. Tree selection and planting was relatively easy, and the trees needed little care until they had been in the ground about three years. Then I knew it was time to prune, and I felt faced with a daunting task. The first thought that came to mind was the medical principle: Do no harm. I knew that I needed sharp tools so I got out my pruning shears and loppers. With the help of a little steel wool, a sharpening stone and a few drops of mineral oil, my pruning arsenal was ready for deployment. After spending what seemed like hours reviewing each of my 10 fruit trees, I concluded that I had no idea what I was doing. Pruning was not going to be the easy task I had envisioned, and I was concerned about violating the “Do no harm” rule. Research was required. Thanks to several books and the Internet, I developed a better understanding of pruning, starting with why it's necessary. Top three reasons: You prune to strengthen the branching structure;to control tree size for ease of harvesting; and to both promote and control fruit production. Lastly, at least to me, you prune for aesthetic appeal. I care less about how the tree looks and more about how much fruit it produces and how the fruit tastes. After my research, I was able to formulate a general pruning approach. By general, I mean that fruit-tree pruning is not a one-size-fits-all endeavor. Different trees have different needs. Start by removing any dead, damaged or diseased branches. Dead wood will be dark or brittle, often with the bark falling away. Diseased wood is often a different color than the other branches. You can, and should, prune dead, damaged and diseased wood at any time of year. Whenremoving diseased wood, be sure to clean your toolsafterward so you not spread disease to other trees. Use a solution of 10 percent bleach and 90 percent water. Next, remove any suckers, the branches growing from the base of the tree. Then cut off any water sprouts, thin branches that usually grow straight up. They will never bear fruit, and they just sap energy from the plant. Removing them early in the pruning process will help you see the structure of your tree and make it easier to see where further cuts are needed. Prune out downward-facing branches as they will be shaded and won't be productive. Remove any branches that cross or rub against larger branches. Over time, the sustained rubbing would damage both branches.Each branch that remains should create an angle of at least 45 degrees. Now focus on thinning interior branches so that sunlight can reach all the fruit. Light penetration is essential for flower-bud development and for optimal fruit set, flavor and quality. Be ruthless. You can safely remove up toone-third of the branches. Cut off all spindly growth. Although a mature tree may be growing in full sun, a dense canopy may not allow enough light to reach the interior. Thinning the canopy also enhances air flow through the tree, minimizing the risk of fungal diseases. Last but not least, prune your fruit trees to the desired height. I don't want to get out a ladder every time I want an apple or peach, so about eight feet is the maximum height for me. After you finish pruning, practice good sanitation and cleanup the area. Remove fallen leaves, mummified fruit remains, twigs and branches. I put everything except diseased wood in my compost pile. The diseased wood goes into the yard-waste bin. I have covered what you should do. Now I'll mention acommon practice to avoid. Do not apply sealing compounds or dressing to pruning wounds. Research shows that these materials seal in moisture, which promotes rot. Leave the cuts open so they can dry and heal naturally. Now it's time to sit back, relax and dream about sampling the year's first peach, apple or plum. You've earned it. I fell in love with the idea of growing potatoes after hiking the Inca Trail in Peru several years ago. There I saw the steep terraced hillsides where the local people grow corn and potatoes with no tractors to assist them. The gardens were outlined with rocks. I imagine that these farmers high up in the Andes are growing potatoes much as their ancestors did when the tubers were first domesticated between 5000 and 8000 B.C. It's pretty staggering to think how long humans have been growing potatoes. An estimated 4,000 varieties exist worldwide, but here in Northern California we have a smaller selection. Still, seed catalogs offer a variety of types, such as fingerlings and russets, and a range of skin and flesh colors, including pink, white, red, purple and yellow. Varieties vary in size and number of days to maturity. Some are best for baking, others better suited to frying or boiling. After returning from Peru, I began to grow potatoes in my own garden. I have since learned a lot, having planted them in many different conditions. Potatoes need well-drained soil rich in organic matter; they do not do well in heavy clay. They have shallow roots and need constant moisture but will rot if the soil is too wet. Full sun is required. Being sensitive to frost and heat, they do best as a spring or fall crop in Napa County. Local nurseries have seed potatoes available for sale now. Potatoes are susceptible to a host of diseases (remember the Irish potato famine? ), so you should always plant certified seed potatoes rather than starting with supermarket potatoes. Potatoes are members of the nightshade family (Solanaceae), which also includes peppers, eggplants and tomatoes. To prevent soil-borne diseases, rotate these crops so that you never grow nightshade plants in the same plot two years in a row. A three-year rotation is even safer. A day or so before planting, cut your seed potatoes into chunks, each containing one to three eyes. The eyes are the buds from which your potato plant will sprout. If your store-bought potatoes have ever sprouted, they sprouted from an eye. Bury seed potatoes four inches deep. A few weeks after the leaves emerge, you need to “hill” the plants by mounding more soil around the stems. Hilling will increase your yield because new potatoes grow between the original seed and the soil surface. Each growing season, Napa County Master Gardeners select a fruit or vegetable to “field test” in our home gardens. We compile and analyze our results for the benefit of the public. We now have a blog called “Spill the beans "where you can find the results of our field trials and other timely gardening information. 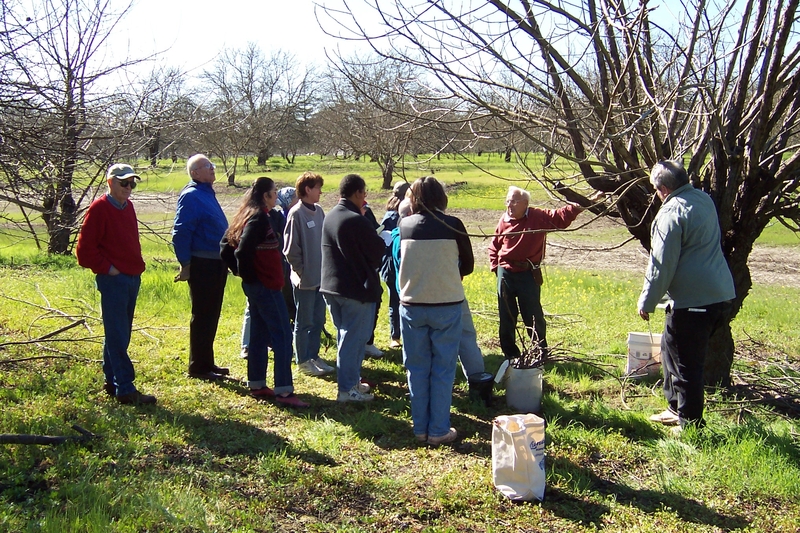 You can subscribe to the RSS feed for our blog on our website (http://ucanr.edu/sites/ucmgnapa). 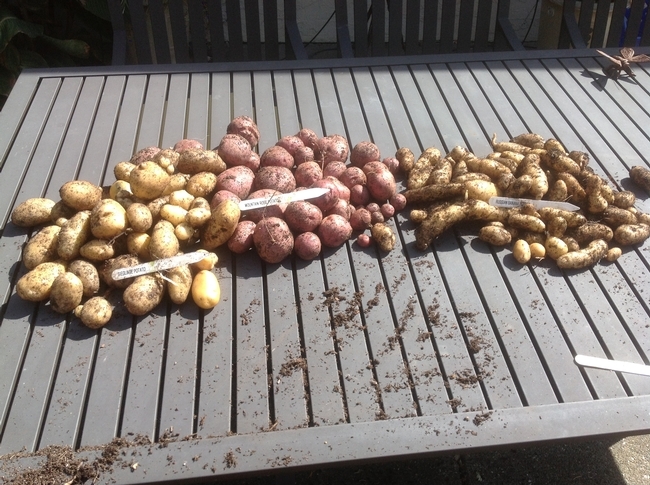 Last year the field-test committee trialed three different potato varieties: ‘Mountain Rose' (an early-maturing variety with rose-colored skin and flesh);‘Russian Banana' (an heirloom fingerling variety); and ‘Sieglinde' (a yellow, waxy mid-season type). With more than a dozen Master Gardeners participating, representing a variety of growing conditions and irrigation techniques, it was interesting to see the results. The greatest yield came from raised-bed gardens with drip irrigation. Several participants planted their potatoes in Grow Bags (porous fabric pots), while others planted in the ground. Some watered by hand while others had drip systems. Some gardeners had success burying their seed potatoes in a tower of straw instead of planting in soil. As the plants grew, the gardeners added more straw. For all of us, the take-home message was that gardens with regular watering and well-drained and well-cultivated soil produce the greatest yield. I confess that I planted mine in a bed without irrigation. They did not do well in the summer heat, and I never harvested anything. But I am happy to note that the potatoes are coming up again in that bed, and I will try to take better care of them this time. My family's favorite part of potato growing is the harvest. Early-maturing varieties may be ready after only 60 days. My children and I get very excited when the plants start to flower. That's a sign that you can plunge your hand into the soil and find some new potatoes. At this point, you should stop watering and let the foliage turn yellow and die back. If you leave the new potatoes in the ground for at least two more weeks, the skins will harden and the potatoes can be harvested and stored in a cool, dark place. Alternatively, you can leave them in the ground until you are ready to eat them. For more information, consult “Growing Potatoes in Napa County” by former county farm advisor Dean Donaldson. You can find this document online on our website(click on Gardening Resources, then on Healthy Garden Tips). Or pick up a copy during our office hours (address below). Whether February days are stormy and wet or cold and dry, there is plenty to do in the garden. When we finally have some rainy days, take the opportunity to do some garden “bookkeeping.” Set up a garden calendar or journal. Have a page for seed-starting dates, fertilizer dates, watering schedules, first harvest, and a space for notes on what did and did not work. Include a page for daily temperatures and rainfall. I have an inexpensive indoor/outdoor thermometer inside on my counter, with an additional sensor outside. I can check inside and outside temperatures from the kitchen by just pushing a button. Rain gauges come in a range of styles and prices, so check your local nursery or home-improvement store. Depending on your organizational style, a computer-based gardening program might work for you. Or perhaps you would prefer a spiral-bound notebook in a waterproof case that you can take into the garden. If we finally get ample rain and the soil becomes saturated, cover sections of the garden to get a head start on spring crops. Use clear plastic tenting to exclude excess rain and raise the soil temperature. Remove the plastic between rains (I'm obviously an optimist) to evaporate excess moisture. It might seem early to be thinking about planting, but fruit trees, shrubs, vegetables and flowers can all go in the ground this month. If the soil is not too wet, you can dig up and divide overcrowded clumps of perennials. Valentine's Day is imminent. Potted red camellias, cerise azaleas or white gardenias make lovely romantic gifts that can transition to long lives in the garden. Even if you're not buying for a Valentine, February is a great month to visit nurseries to view color options on blooming camellias and other winter-flowering shrubs and plants. Bare-root asparagus and rhubarb are still available, but not for long. Both are long-lived crops that will produce for years in an area they like. Potatoes are also in nurseries now and can be planted along with carrots, peas, onions, radishes, lettuce, spinach, parsley and chard. 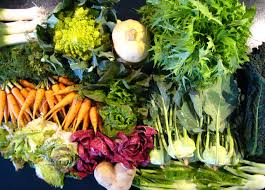 To these familiar vegetables, consider adding Asian greens, cresses, arugula and kales. If you grow warm-season vegetables from seed, it is time to pull out your warming mat and set up your lights or find your sunniest window. Early in the month, start seeds for cabbage, cauliflower, onions, parsley and lettuce. Later in the month, sow seeds for your favorite tomatoes, peppers, eggplants and basil. If you have raised beds in your garden or hills with ample compost, winter squash and pumpkin seeds can go directly in the ground now. I began popping in a few pumpkin seeds this early after noting that volunteer squash seedlings always came up much sooner than I felt safe planting them. They ripened and were ready to harvest sooner, too. If you are craving color, shop now for penstemon, dianthus, coreopsis and sages. Or trade with gardening friends who have an excess. Shop for dahlias now. These Escher-like flowers, geometrically complex and available in a huge range of sizes and colors, make fanciful additions to the garden and can create whimsical memories for little people. If you buy dahlia tubers, select those with several “eyes” on each stem and plant late in March. Until then, keep them in moist wood shavings so they don't dry out. Prepare their bed according to the planting directions that come with them. If you see evidence of snails or slugs (slimy trails are one clue), try setting out inverted flower pots, propped up a tad on one side so the pests have a way in to the “snail hotel.” Collect your victims in the morning and throw them away or feed to your chickens. Thisnon-toxic approach keeps chemicals out of your garden and away from pets and children. Spray peach and nectarine trees to prevent peach-leaf curl just when the buds begin to bulge and show color. Alternatively, you can pick off the crinkled leaves as they appear, put them in a bag and dispose of them. Eventually the tree will replace them with healthy leaves. Weeds begin to appear now. Tackle them with pre-emergent herbicides, hula hoes or your favorite implement. Try to catch weeds early, before they go to seed. If they have set seed, toss them in the yard-waste bin. Weed seeds often survive home composting. Drought alert: Yes, you should be watering your plants since nature is not. Water any plants that still have leaves. Many California native plants need water now and should be your top priority, followed by newly planted trees, fruit trees,other large trees and any plants pushing buds. Dormant plants that leaf out early should be watered before those that leaf out later. Make small plants a lower priority as they cost less to replace than trees and large shrubs. Fruit trees that get irregular or insufficient water may drop fruit or produce undersized or malformed fruit. Workshop: Napa County Master Gardeners will host a workshop on “Fruit Tree Pruning” on Saturday, February 22, from 9:30 a.m. to 11:30 a.m. (indoor lecture) and from 12:30 p.m. to 2:30 p.m. (outdoor hands-on workshop). Lecture location is the University of California Cooperative Extension, 1710 Soscol Avenue, Napa. Outdoor location to be determined. Why grow vegetables? Backyard gardeners give a range of reasons. Some believe their homegrown produce is safer, more flavorful and more nutritious than what they can buy. Others say that vegetable gardening helps the environment or improves their quality of life. Although each of these claims may be true, for me the answer is simpler: I grow food for my table. As I have become a more knowledgeable vegetable gardener, I have wanted to increase the variety of crops I grow and to harvest year round. Plants are adapted to grow at specific temperatures. Some annual vegetables prefer warm weather; others perform best when it’s cool. Warm-season plants grow best in daytime temperatures of 65°F to 95°F. They thrive when night-time temperatures stay above 50°F. Most of them tolerate high temperatures but are damaged or killed by frost. Cool-season crops prefer cooler soil and air (55°F to 75°F), perform poorly when temperatures are high, and tolerate or are improved by frost. When researching average temperatures for Napa County, I found some useful graphs on the Weather Channel’s website (www.weather.com). From May to October, our average lows range from 49°F to 55°F, while average highs for the same months are 76°F to 83°F. The months of November to April see average lows of 39°F to 45°F degrees, and highs of 57°F to 71°F. If our weather is not too extreme, we can accommodate cool-season vegetables six months a year and warm-season vegetables during the other half. So growing vegetables year-round in Napa County is just a matter of timing: growing the right plants at the right time. Year-round vegetable gardening uses soil intensively, so maintaining fertility is critical. Soil is comprised of four principal components: minerals, organic matter, air and water. Minerals and organic matter make up about half of the volume of typical California soils, with minerals being by far the largest part. Soil minerals are basically decomposed rock. The size of the particles determines whether your soil is sandy (large particles), loam or clay (small particles). Organic matter consists of decomposing plant and animal residue, living soil organisms (earthworms, fungi, bacteria) and the substances they synthesize. The other half of the soil’s volume is the pore spaces between the solid particles. In soils with ideal moisture content, the pore spaces are about half water and half air. Typical soil by volume will be about 45 percent minerals, 25 percent water, 25 percent air and 5 percent organic matter. Soils can be coarse and sandy or fine and clay-like. Their texture reflects the mineral content, which is difficult to alter. However, increasing the organic matter in sandy or clay soils changes the way the soil aggregates, or clumps, and improves the conditions for growing plants. Although the living organisms in soil comprise a small percentage of its volume, mounting scientific evidence suggests that these organisms play a significant role in helping plants fight disease and pests. Many soil microorganisms live in beneficial relationships with roots. These organisms digest organic matter over time and need air and moisture to survive. Even when you don’t have a crop in the ground, you need to provide an environment that encourages this soil life. In a year-round vegetable patch, you should add compost or other organic amendments at least twice a year, or each time a new crop is planted. Our California soils tend to be low in nitrogen, a major nutrient for growing plants. Your soil may also be lacking in other nutrients. Year-round vegetable gardening can quickly deplete soil nutrients. If your organic amendments are not relatively high in nutrients, you will need to fertilize several times a year. Although you can use synthetic fertilizers, they can harm the natural soil life. Use all fertilizers carefully, following package directions and never using more than recommended. Plants interact with soil in different ways. Just as farmers do, home gardeners should rotate crops to prevent soil-borne diseases from getting established and to foil pests that prefer specific crops. So here’s 12-month gardening in a nutshell: plant the right plants for the season;feed the soil with organic amendments; use fertilizers as needed; and rotate plants. Then proceed to enjoy homegrown food year round. Of all the tasks that await the gardener in January, my favorite is reviewing the offerings from seed companies. In past years, the catalogs would start arriving before Christmas, and I would stash them for a post-holiday treat. In these electronic times, I am just as likely to receive an enticing e-mail with news of the latest hybrids, rediscovered heirlooms and recently developed strains of old favorites. January is perfect for assessing your collection of saved seeds and making plans for the next round of gardening. If you enjoy starting your own vegetables and annual flowers, order seeds from catalogs now to get them before you need them, at the end of January or early February. My least favorite winter task is watering, but in this dry winter, we must water to keep plants healthy. Vegetable gardens planted in the fall with winter greens, broccoli, onions and garlic will not thrive unless watered. Water vegetables when the top one to two inches of soil have dried out, and moisten the soil to a depth of 8 to 12 inches. Perennial plants that grow and bloom in winter, which includes most native plants, will also need regular watering. Plants that go mostly dormant in winter, such as roses and fruit trees, still need some water to stay healthy. And frost-tender plants like citrus need to be kept well-hydrated to help them fend off frost damage. In our climate, January is historically the coldest month. However, we can hope that we will not be repeating December’s run of below-freezing nights. Be sure to protect tender plants when frost threatens. If the rains do come, expect an increase in weed growth. Control weeds while they are small, hoeing or pulling them out. Whenever possible, use mulches to control weeds and conserve soil moisture. If you use organic mulches, the material will break down over time and improve your soil. Insect pests tend to be less of a problem in cold weather, but I noticed that aphids on my cauliflower and broccoli survived December’s frigid temperatures. Control these plant-sucking pests by spraying them off with water. Vegetables tolerate a few aphids, but these insects seem to multiply quickly if not addressed early. Deciduous fruit trees should be dormant now, with all leaves gone. Now is the time to prune and shape them. First remove all broken, diseased or dead wood, then look at the tree from all sides and tackle pruning for shape and for fruit. Different types of fruit trees require different amounts of pruning, so consult a knowledgeable tree source if you do not know how much growth to remove. Winter is also the time to spray fruit trees to control pests. Copper-based fungicides control fungal diseases such as peach leaf curl and powdery mildew. Spray on a dry, wind-free day and be sure to follow all precautions on the product label. Dormant oil sprays can help control insect pests such as scale and mites by smothering their eggs. Delay spraying until close to bud break in late winter or early spring. Nurseries have a good supply of bare-root fruit and shade trees now. Bare-root trees are an economical way to add to your orchard or beautify your landscape. Keep the roots moist after purchase and plant as soon as possible. When preparing the planting hole, do not amend the native soil too much. Add no more than 25 percent compost to the soil that covers the roots to encourage the roots to dig deeper for nutrients. Plant the crown of the tree higher than the soil surface to allow for settling over time and to keep the crown from being inundated with moisture during rainy periods. Mulch well, keeping the mulch four to six inches away from the trunk to prevent crown rot. Bare-root choices also include roses, ornamental vines, artichokes, strawberries and asparagus. As you would for bare-root trees, keep the crown of the plant at or above soil level when planting. Any vegetables you planted in fall are probably growing slowly now, but check them often for maturity and harvest as ready. 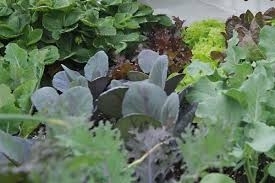 These might include lettuces, parsnips, beets, carrots, cabbages, broccoli and radishes. You can get an early start on the spring planting season by sowing seeds now for kale, parsley, radishes and spinach. These crops can be direct-sown outdoors, while the brassicas (broccoli, cabbage, cauliflower) should be started indoors for transplanting next month. Enjoy the slower pace of January gardening. And if you have any influence with the weather gods, have them send us some rain. Workshop: Join Napa County Master Gardeners for a workshop on “Rose Pruning” on Saturday, January 18, from 10 a.m. to noon, at the University of California Cooperative Extension (address below). 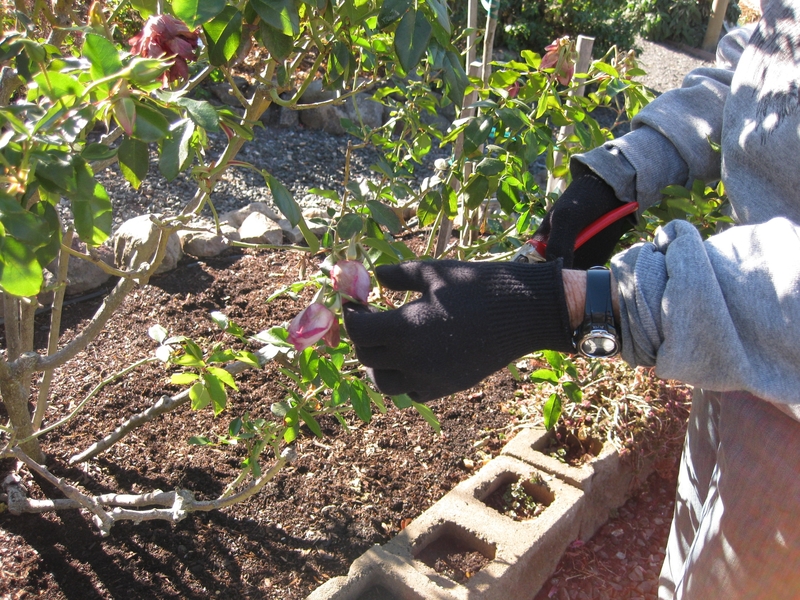 January is the best time to prune your roses. Come learn pruning techniques from a certified Rosarian. Bring your rose questions. Online registration (credit card only).Mail-in registration (cash or check only).